Rating: Fairly strenuous day hike with some scrambling. Length: Roughly 5 miles for "lollipop" loop hike up Giant Slide to Sargent Mountain and back. Elevation Change: 1300 ft elevation gain to the top of Sargent Mountain. The trail heads east through a typically beautiful forested valley through an unusually flourishing lichen community. As the signs warn, please stay on the trail to protect these fragile plants. Soon enough, the trail enters Acadia National Park proper and after the first carriage road crossing, the trail joins up with Sargent Brook and the hike gets much more interesting. 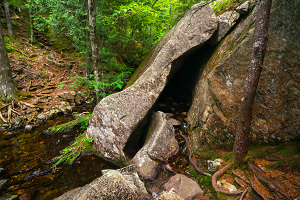 The trail follows Sargent Brook up a small boulder-strewn valley (aka the "Giant Slide.") 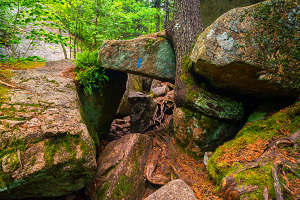 Hikers must boulder-hop to cross the stream several times, scramble up and around several obstacles, and even crawl under a few chockstone boulders. Just past the junction with the Sargent Northwest Trail (our return route), the trail even goes through a cave-like formation created by a giant slab of granite. While all of the scrambling may be strenuous and may get your shoes wet, this section of trail is FUN! Soon enough, the terrain mellows out and we cross over another carriage road, the "Around-Mountain Carriage Road." For the return hike, from the summit of Sargent Mountain, take the Sargent Northwest Trail back down; this trail feels like one of the least-traveled stretches of trail in the park. 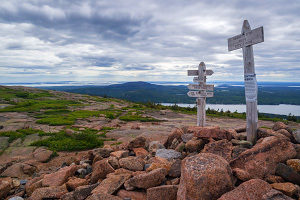 After crossing the Around-Mountain Carriage Road again, the Sargent Northwest Trail continues its descent back to Sargent Brook and the intersection with the Giant Slide Trail. Retrace your steps back to the Giant Slide trailhead. 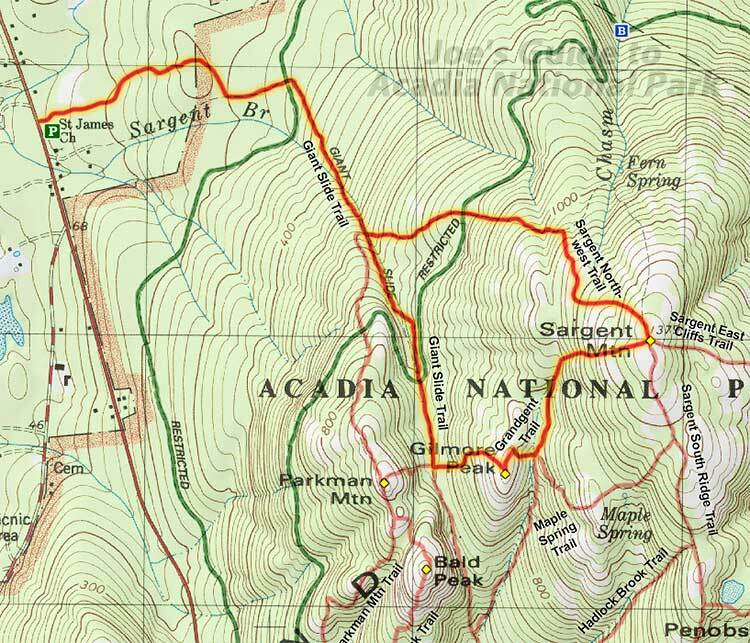 Note: With so many trails in the area, the Sargent Mountain loop is just one suggestion. Doing a loop up to Parkman Mountain with a side trip to Bald Peak would also be fun. The Giant Slide Trail is a fun and unique route that confirms that hiking isn't always about the destination; it's about enjoying the "getting there." I'm ever thankful for the historic Acadia trailblazers for finding so many unique and amazing spots and setting trails through them so that we can all enjoy them. If you're looking for something different and fairly strenuous, this is a wonderful route!